If you want to know how to catch tarpon, you’ve got to get familiar with it, and the first thing you should know is that the fish grows up to 7 ft. long and can weigh over 300 lbs. The tarpon is also one of the big fish that can be found near the shore, so it’s possible to catch it without using a boat. If you plan on catching one of the big ones though, a boat will be necessary. Tarpon are usually found in salt and freshwater thanks to their swim bladders and because they can directly swallow the air. It is common to see them rolling, partially exposing their back, through the water, similar to a dolphin or porpoise. When it comes to food, they typically consume crabs, shrimp and other small fish, and they’re also notable for large scales which anglers often keep as a souvenir after releasing the fish. Tarpon have very hard mouths so it’s going to take some effort to hook, and if you do get them hooked the fish will fight, jump and thrash around. During the struggle the tarpon usually ends up throwing a part of the leader or the hook. Bottom line: if you’ve never gone tarpon fishing before, be prepared as they’re not going to give up easily. What Tackle Should be Used? Contrary to popular belief, you don’t need to use a very heavy tackle to catch the fish. There are some anglers who have caught 100 lb. tarpon with an 8 lb. test line. However that really isn’t required and is more suited for experienced anglers who want a challenge. In most cases, a 30 lb. test line is more than enough to offer some challenge, but at the same time it is heavy enough not to tire the tarpon too much. It’s also possible to use a braided line but monofilament has the flexibility to handle their acrobatics and thrashing around. Both will work as long as the drag is set properly on the reel. The pointers given above are for the big tarpon, but if you’re only going after the smaller ones, downsizing is necessary and you’ll do fine with a medium-sized tackle. Even so it that doesn’t make hooking any easier as the fish will still put up a fight. There are many tarpon fly fishing techniques you can use, but the best places to start are the estuaries and rivers since that’s where the fish usually cluster in. Anywhere near the shore is a good bet actually. You can catch one with lures or bait, but the best results usually come with bait and circle hook, depending on your ability. There are also a number of lures you can use to get some bites, but make sure to get quality bait, otherwise the tarpon will be difficult to catch. If you’re new to this, it’s a good idea to work on your reflexes because a tarpon jumps a lot and won’t hesitate to send the lure straight back to you. What Lures Should I Use? Some anglers use jerkbaits but unless you’re an expert, it’s best avoided because the treble hooks can fall off easily. Jigs, soft plastic lures, and poppers are far more effective. But regardless which lure you decide to use, try one with just one hook as that won’t give the tarpon the opportunity to throw it off. It’s well known they bite off jigs, so get a bucktail jig and add a soft plastic tail to it. If a tarpon bites, set the hook 6 times hard. Remember to fish at the bottom so you get several opportunities to set the hook before the tarpon starts jumping. If you’re learning how to catch a tarpon, keep in mind too that some anglers are able to catch some with lures that slide off the hook as it takes away the tarpon’s leverage. 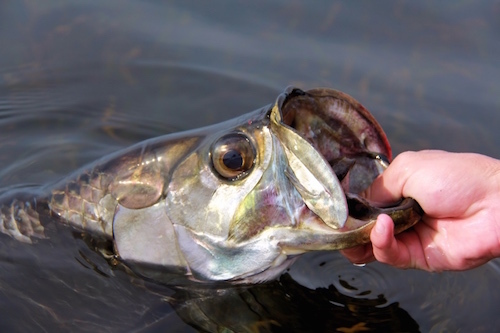 What are the Best Tarpon Baits? This is really a matter of personal preference, but for beginners you cannot go wrong with sardines or mullet, live or dead and used with a circle hook. Once you’ve got the sardines you just have to wait for the tarpon to take a bite. When it starts swimming away, start reeling in the circle hook that is hooked up on the fish’s mouth. It’s a little known fact that the tarpon is a scavenger and will happily eat a dead mullet or the carcass of another fish. So, don’t overthink the live bait issue. In one of the top tarpon fishing spots in the world, Boca Grande, Florida, many anglers flood the area in the beginning of June each year to try and land the silver king. The Boca Grand Pass is where Charlotte Harbor enters the ocean. And after the spring rains, it washes an abundance of juvenile blue crabs down through the harbor, into the pass, where the tarpon are waiting to feed on them. The tarpon fishing guides and local bait shops know this as well, so they usually have these “tarpon crabs” available during this time. If you are fishing for tarpon in Southwest Florida, this is the bait to use. Be prepared because when you hook a tarpon it’s going to begin leaping up and thrash wildly. Once the fish is up in the air, drop the rod tip quickly so the line slacks, as this is one of those occasions when a slacked line is preferable when handling a fish. To put it simply, a tight line is easier to break, and it will snap as the tarpon struggles. As soon as the tarpon goes back in the water, raise the reel line and rod tight, and after the fish stops jumping, apply as much pressure as possible and change the angles as often as you can. This is important because it keeps the tarpon off-balance and makes hauling in easier. Forget about applying pressure in a single direction because the tarpon will learn how much resistance is required so it doesn’t get reeled in, so it’s going to put more of a fight. And don’t let the tarpon rest during the struggle because it might end up with its second wind. With the techniques given here you can land some tarpon from 70 lbs. to 130 lbs., and it usually takes around 15 minutes or less before you get a catch, though it will also depend on the location. As was pointed out above, vary the angles and pull hard: avoid constant pressure on the tarpon because it’s going to be harder. A few other things to keep in mind: your line has to be always moving and if your line isn’t peeling, you’ve got to reel them. You may have read some anglers who say it takes an hour to pull one in, but that’s because they’re using the wrong techniques. Follow the tips given here and you’ll be catching tarpon in no time.